Like I mentioned in the earlier post about my coffee table, I have a lot of Macallan cask wood. It didn’t take me long to do something else with it! A friend had a set of the 1950, 1955 and 1957 Lalique bottles from Macallan that he planned to send to Bonhams in Hong Kong for auction. The Lalique Collection is the result of a very close relationship between the two companies and will continue over the next few years to be 6 bottles in total, housing some of the rarest and finest liquid The Macallan has to offer. This is a key point – there’s a lot of old whisky out there and anyone that knows their stuff will attest to the fact that some of it is, frankly, crap. When it got old it got nasty, but some distilleries still sell it for mammoth amounts of money knowing it will likely never be drunk. However, some liquid out there carefully followed Demi Moore’s plan of attack (minus the drug addiction bit...she get's a pass on that one) and got better and better and better with age. I’ll attest that the Lalique bottles are full of Demi Moore Whisky. I know this thanks to a drunken night in the tasting room at the distillery... I’m probably not supposed to share that. Sorry, back on track, I love lamp. The trouble with auctioning them all together is that they are in 3 separate boxes, and that’s just…well…it just didn’t seem right to sell as a collection in loose boxes, so I decided we should make a chest out of cask wood. My friend is usually the instigator of these projects, so he didn't take any convincing. Croft House stepped up again and all it took to make a great chest was a few sketches, a lot of inspiration images and a pretty clear idea on the hardware I wanted to use - think “upscale pirate fodder”. The collection, after authentication by Macallan, snagged a 3 page spread in the Bonham’s catalogue and was picked up by worldwide liquor press. Oh, and yeah, it sold for a stack of money. Result. Video Interview - The Macallan Masters Of Photography - Annie Leibovitz. 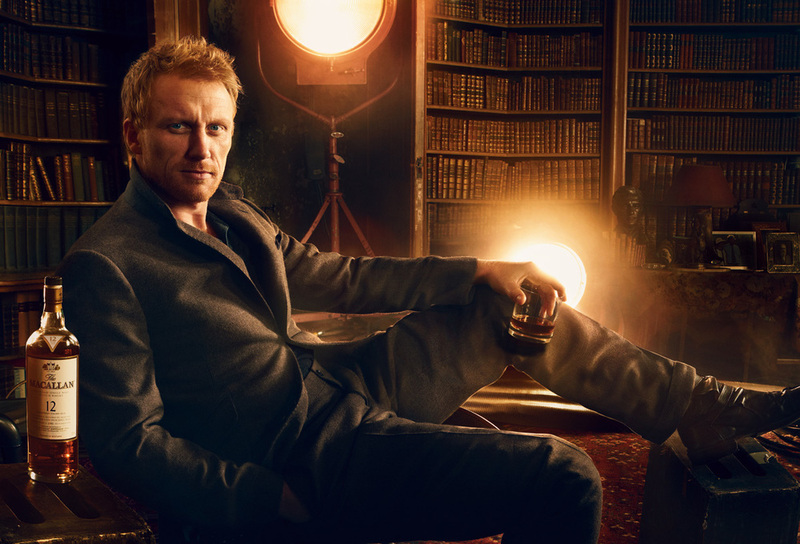 The first post of a few posts on the Masters Of Photography collaboration The Macallan have completed with Annie Leibovitz and Kevin McKidd. The next post is will be a fun story about how randomly bumping into Kevin AT Croft House in Los Angeles was the catalyst for spawning this project. Until then, this is a fun video from The Macallan where I discuss the shot we did at a bar in Hudson, NY. Photo Credit: The Macallan and Annie Leibovitz - All copyright belongs to them, I'm just sharing. My good friend and mentor, Ken, has a world class weak spot for valuable whisky. His collection will probably end up in a museum one day, or we’ll die drinking it all when we find out the Mayan’s are correct about 2012. It’s housed in a bunker underneath his home and is accessed via a secret elevator - more on that another day. This last summer, he, I and another friend decided to head over to Scotland and visit some distilleries. I’ve done some of the whisky trail before and it’s great fun, but let me tell you, it’s a little different when you consult to one of the brands and are travelling with a guy who owns more of their old stuff then most of us could ever conceive. I couldn’t believe the “insider” treatment we received, most notably from Glenfiddich and The Macallan. We stayed in the 300 year old Easter Elchies house on Macallan’s grounds and were hosted impeccably by their team. It was the most magical place to wake up to on the banks of the river spay, with early morning Scottish mist (fog). Both distilleries did what I'm coining “open cask” tours for us. That basically means if we pointed at a cask and asked a question, we got to taste it. Frankly, it was nuts and at some points a little overwhelming. I think at one point in time I had 2 glasses in my hand and we couldn’t remember which was the 1934 or the 1941 - so I did the noble thing; I drank both and refilled, just to make sure. Forgetting the craziness for a minute, these old distilleries filled me with awe wherever we went. I guess it maybe seems stupid, but it was moving to sit by a cask, knowing that it lived in that spot through 70 years and a world war and still houses something that tastes so delicate and incredible. There was a cask of ‘41 at Glenfiddich that really stuck with me. I got lost thinking about the fact that it was being filled back when my 19 year old grandfather was gearing up with his mates in Burma to go dogfight in his spitfire. I know that partying and drinking is fun, but I get such enjoyment pondering the history of good whisky as well. Another incredible thing I learnt is that every bottle of a certain age, let’s say 12 year old, comes from an exact mixture of 55 casks of 12 yo. Not every cask tastes the same, though, so Ian in their lab takes a 10ml sample of every cask and mixes exact portions of the 55 samples to get the approved 12 yo taste AND color. These exact portions are then scaled up to barrel volumes. It seemed like completely mad science, but it works. I just drank an 18 from 1983 and it tasted like the 18 I know so well. I love being back in Scotland and I love the culture of the whisky business. Hopefully this will make you ponder the history just for a second when you pour your next dram.